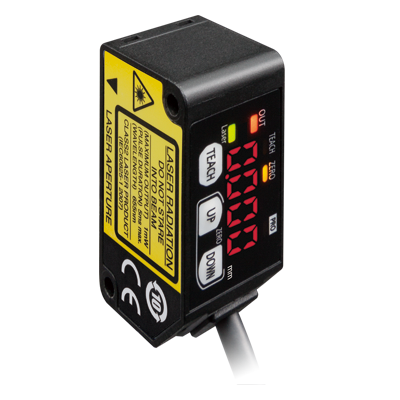 (Note) This product complies with 21 CFR 1040.10 and 1040.11 Laser Notice No. 50, dated June 24, 2007, issued by CDRH (Center for Devices and Radiological Health) under the FDA (Food and Drug Administration). Beam diameter ø300 μm 11.8111 mil approx. (Note) This is the size in the measurement center distance. These values were defined by using 1/e2 (13.5% approx.) of the center light intensity. Due to leak light outside the specified area, the reflectance around the detecting point may be higher than at the point and this may affect the measurement value. Note : Analog current output has been added from shipment in August 2016. - Input impedance: 10 kΩ approx. Cable extension Extension up to total 10 m 393.701 ft is possible with 0.3 mm2, or more, cable.